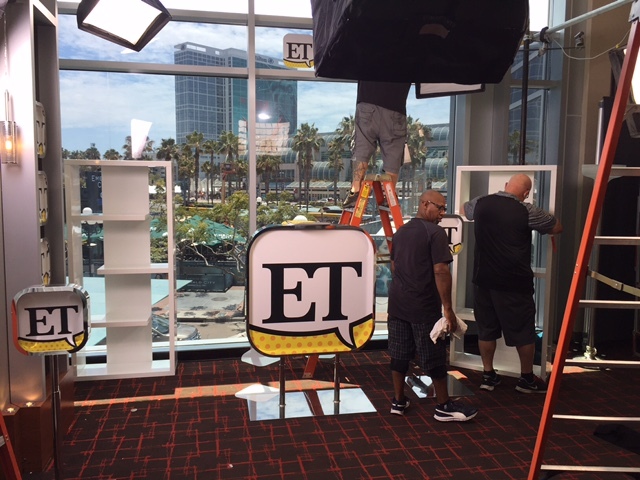 We’re celebrating another busy and productive summer of San Diego video production services capped off by successful projects for two high-profile clients — Warner Bros. and “Entertainment Tonight” — during Comic-Con. A Room with a Comic Con View! It was Solana Productions 17th consecutive year covering the San Diego event, which we’ve seen grow from a local comic-book convention to a unique, international pop culture extravaganza. For Warner Bros., our expert lighting and production crews returned for the 7th year in a row, working tirelessly two days before Comic-Con to install an intricate network of wireless video equipment at the studio’s booth in the Exhibit Hall. Then, as stars arrived to promote their films and TV shows and sign autographs, two Solana Productions production teams rolled continuously on the fan interaction. Our video crews rarely paused for a break during these live events, capturing the stars of “Suicide Squad” (Will Smith, Margot Robbie, Jared Leto, Viola Davis, Scott Eastwood and Cara Delevingne), “Wonder Woman” (Gal Gadot, Chris Pine and Connie Nielson), “Kong: Skull Island” (Tom Hiddleston, Brie Larson and John Goodman), and “King Arthur: Legend of the Sword” (Charlie Hunnam). We also sent Solana’s San Diego video production team members into several Convention Center break-out rooms to record important announcements and cast introductions made during Warner Bros. television panels.